The last time the automotive industry in the United States experienced rapid technological change was more than a century ago. In 1900, the industry (whose primary competitor was the horse) comprised 40% steam-powered, 38% electric-powered, and 22% gasoline-powered vehicles. After the advent of mass-production, made famous by Henry Ford’s 1908 Model T, the internal combustion engine rapidly became the dominant automotive technology, and by the 1930s competing technologies were all but extinct. Since then, the industry has followed a century-long trajectory of steady, incremental innovations that have gradually improved vehicle performance across a variety of metrics such as horsepower, fuel efficiency, emissions, and safety. Today, the automotive industry is beginning to enter another period of rapid change with the emergence of three revolutionary technologies: electric power trains, autonomous vehicles, and ride sharing. These revolutions have the potential to shape not only the trajectory of automobile design and performance but also the long-standing automotive regulatory environment and the entire personal transportation system. Despite their disruptive potential, all three technologies still require one critical piece of infrastructure: roads. The nation’s more than four million miles of roads play a vital role in the economy. But maintaining them is expensive. According to the American Society of Civil Engineers, the United States will need to spend more than $3.4 trillion on infrastructure through 2020, half of which will be for roads, bridges, and transit. Today, funds for infrastructure spending primarily come from taxing fuel consumption—a policy approach that is desperately outdated and unable to cope with the changes brought by emerging automotive technologies. The steady decrease in fuel consumption brought by increased average vehicle fuel economy and greater adoption of electric vehicles already threatens state tax revenues and the solvency of the Federal Highway Trust Fund. Nor does the fuel consumption tax offer the flexibility necessary to adapt to new road use patterns enabled by autonomous and shared vehicles. Although the funding situation for roads is grim, it is not too late to make the changes necessary to avoid disaster. Replacing the fuel consumption tax with a tax on vehicle miles driven is one possible solution that more accurately tracks with road damage and offers a wider range of options for navigating the looming revolutions of electric, autonomous, and shared vehicles. 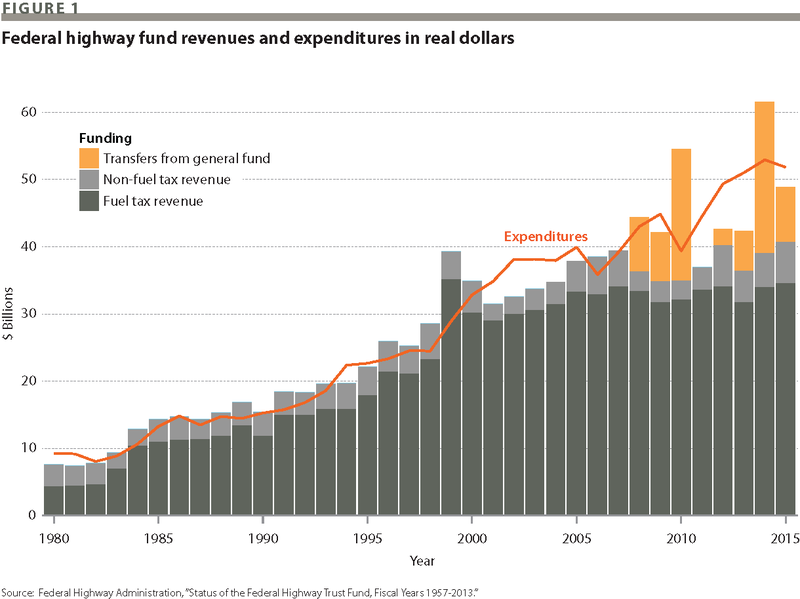 Established in 1956, the Federal Highway Trust Fund bankrolls highway construction and maintenance, and for the past 60 years it has primarily depended on excise taxes on gasoline and diesel. Over the past decade, expenditures have continued to increase, running between roughly $40 billion and $50 billion annually, but revenues from fuel taxes have flatlined at roughly $35 billion to $40 billion annually due to steady improvements in vehicle fuel economy, changes in driving patterns, and inflation. 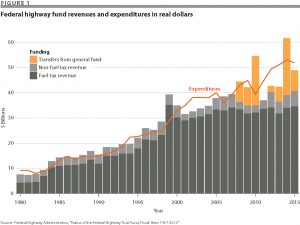 Since the 2008 recession, the federal government has begun diverting funds from the General Fund of the US Treasury to make up shortages in the highway fund. The diverted sums have increased from $8 billion in 2008 and $7 billion in 2009 to $19.5 billion in 2010 and $22.5 billion in 2014. The figure below illustrates the increasing dependence of the highway fund on these transfers to remain solvent. Many states also levy fuel taxes to support their roads. But here, too, funding is falling short. An analysis by the media platform group Governing shows that state fuel taxes over the past two decades have not kept up with inflation in two out of three states. More than 10 states have had no choice but to raise gas taxes in recent years, and more than 10 are considering a raise in 2017. But keeping up with inflation is the least of the looming problems for federal and state infrastructure budgets. Even if the Trump administration relaxes fuel economy standards (which might delay increases in fuel economy in the short term), the revenue gap is likely to worsen. Trends across all vehicle segments point toward continued improvements in fuel economy, which increased by 28% between 2004 and 2015. And more fuel-efficient, hybrid, and electric vehicles are coming on the market each year. Thirteen automakers offered at least one electric option in 2016. Tesla announced the 215-mile-range all-electric Model 3 (which received a record-breaking 400,000 preorders) and Chevrolet launched the 238-mile-range all-electric Bolt. The overall number of plug-in electric vehicle models on the market reached 25, up from 16 the previous year and just 3 in 2010. Battery prices are rapidly falling, and driving ranges are getting longer. Even though plug-in electric vehicles still represented less than 1% of all vehicles sold in the United States in 2016, mandates in 10 states require that 15% of statewide vehicle sales must be zero-emission vehicles by 2025, which, if achieved, would put three million new electric vehicles on the road. All those drivers will soon have the power to extend their ranges as the US Department of Transportation released plans in late 2016 to establish 48 national electric vehicle charging corridors, covering nearly 25,000 miles of highway in 35 states. Faster adoption of electric vehicles is good news for the environment and national security, but the trend is gradually chipping away at federal and state infrastructure funds. A 2015 study by researchers at Carnegie Mellon University showed that greater adoption of electric vehicles could result in revenue generation reductions of $200 million to $900 million by 2025. But even without such an adoption explosion, federal fuel economy standards still require that the sales-weighted average fuel economy of all cars sold by each automaker in the United States must reach 54.5 miles per gallon by 2025, dramatically reducing gasoline tax revenues. The simplest near-term solution is to increase the fuel tax, but that would continue to put an unfair burden on rural households and drivers of less-fuel-efficient vehicles while letting electric vehicles owners off the hook for road maintenance—not to mention that modifying the tax has also repeatedly proven itself to be politically hopeless. The most recent federal increase in fuel taxes was in 1993, and that required then-Vice President Al Gore to cast the tie-breaking vote in the US Senate. State fuel tax raises have been more successful in recent years, but they merely provide temporary respite from the longer-term budget threat of more-fuel-efficient and electric vehicles. For decades, experts have called for replacing the fuel tax with a system that more accurately tracks with road use, such as taxing vehicle miles traveled (VMT). That’s somewhat like taxing the gallons of fuel required to drive those miles, except vehicle miles are independent of the fuel consumed. Opponents of VMT taxes argue that they disproportionately affect lower-income and rural groups, but these worries may be overstated. A study at Oregon State University found that switching to a VMT tax would actually be less regressive than raising fuel taxes. Fuel taxes disproportionately burden rural households because rural drivers on average drive greater distances and in less-efficient vehicles than urban drivers. Although VMT tax schemes would still unevenly burden rural drivers for driving greater distances, they would eliminate the penalty paid for driving less-efficient vehicles. And while fuel taxes are the same for all citizens regardless of income, VMT taxes could be structured to be even less regressive by, for example, using different tax rates based on income brackets. Opponents also argue that VMT taxes discourage the adoption of more-fuel-efficient vehicles. But that’s also what makes them less regressive. And whereas VMT taxes could be structured to charge lower fees for more-fuel-efficient or electric vehicles (making the taxes more regressive), the more important point is that VMT taxes have the flexibility to allow policy makers to decide how to make such trade-offs while maintaining a sustainable revenue structure as vehicle efficiency continues to improve. The fuel tax, in contrast, lacks such flexibility, and if it is to keep up with the nation’s infrastructure needs, it will become only more regressive with time. Reduced fuel consumption may well be accompanied by increased miles driven. Such trends will further undermine the potential of fuel taxes to keep up with the expected increase in road wear and tear from a future of fully autonomous vehicles. For example, with even just partial automation, systems such as Tesla’s autopilot are making longer commutes less arduous. Full automation could enable commercial trucks to travel around the clock, dramatically increasing annual truck mileage and road damage, let alone the anticipated increase in private vehicle miles traveled. Some observers fear a future of “zombie cars” driving in circles with no passengers to avoid parking fees. Yet other trends may push toward less vehicle travel. Ride-hailing providers such as Uber and Lyft could transform the way people take taxi rides, thanks to new ride-sharing services such as Uber Pool and Lyft Line where fares are split with strangers going in common directions. A recent study at the Massachusetts Institute of Technology concluded that ride sharing could reduce the number of taxis in New York City by 75% without significantly affecting travel times, resulting in lower average VMT and reduced fuel consumption. However, since ride sharing dramatically lowers the costs of taking a taxi, mass transit users may move toward shared cab rides over bus or rail alternatives and thus increase average VMT and fuel consumption. Research and experience will gradually reveal the effect these forces might have on overall VMT and fuel consumption, but in the face of such uncertainties, taxing the fuel consumed provides little flexibility for adapting to changing trends. Indeed, uncertainty about when and how electric, autonomous, and shared vehicles will affect travel patterns is one of the strongest arguments for a VMT tax. By taxing the miles, regulators and other stakeholders can work together with greater flexibility to manage the societal benefits and costs of driving. Excessive autonomous driving can be discouraged by charging a higher rate when no passengers are detected, and rates could be dynamically changed to encourage more vehicle sharing during high-congestion periods. The specific details of how rates can be changed to achieve different societal goals is a question for future research, policy experiments, and political debate, but fundamentally it is not such a radical idea; many toll roads, for example, charge different rates depending on the number of axles a vehicle has, presumably due to their disproportionate contribution to road damage. With a VMT tax, other negative societal impacts from driving, such as pollution and congestion, can also be considered. Repealing and replacing a decades-old fuel consumption tax will take serious political effort from both sides of the aisle. Fortunately, a VMT tax offers opportunities that could be attractive to both political parties. Republicans could trade a VMT tax for the removal of subsidies for alternative fuel vehicles such as electric and fuel cell vehicles. Democrats could support it because it encourages energy conservation and can be structured to more fairly tax drivers and different fuels than the consumption tax does. And any politician should be able to get behind a tax scheme that lowers the price of gasoline and diesel. Although it may be feasible to achieve increasingly rare bipartisan support for a VMT tax, implementation could perhaps be the biggest challenge. Unlike fuel taxes, which are nearly impossible to avoid and easy to collect, VMT tax schemes can range from an annual odometer reading to real-time mileage reporting, with each approach facing potentially different implementation challenges. Fortunately, pilot VMT tax programs are helping policy makers understand the strengths and weakness of emerging options. Oregon’s OReGO program has 5,000 volunteers paying a 1.5 cents per mile tax using an onboard plug-and-play device that reports miles driven and fuel consumed while maintaining driver privacy (that is, it does not collect location data). California is conducting a Road Charge program over nine months with 5,000 volunteers choosing different reporting options and simulating payment for the miles they drive. University-led research initiatives such as the 3 Revolutions Policy Initiative at the University of California, Davis, are focusing on key policies and strategies, such as a VMT tax, to facilitate synergistic net benefits to society from vehicle electrification, vehicle automation, and vehicle and ride sharing. The data collected from these pilot programs and research initiatives will provide critical information for understanding the implementation challenges and driver acceptance of these systems and enable policy makers to devise tax schemes that are fair and commensurate with the funding challenges ahead. Increased city and state piloting and testing is an excellent area to start in building up the necessary knowledge and political momentum to achieve this much-needed change. The biggest challenge will be to translate what’s being learned in the laboratory of the states into a viable political strategy at the national level for replacing the fuel tax. There’s no time to lose. Around one hundred years ago, the dominant form of transportation in cities was horses and buggies, and within a decade they were all but completely replaced by gasoline-fueled automobiles. History has shown countless similar examples of faster than anticipated technological change (for example, in a mere decade life without a smartphone has become unimaginable for many of us). A transition to a VMT tax today would enable local and national regulators to begin learning best practices in implementation so society can put in place roads and highway systems to accommodate tomorrow’s more-fuel-efficient, electric, shared, and autonomous vehicles. If we don’t act now, we’re likely to find ourselves with state-of-the-art cars on roads that are unfit for driving. John Paul Helveston (jhe[email protected]) is a postdoctoral associate at the Institute for Sustainable Energy at Boston University. Helveston, John Paul. “Navigating an Uncertain Future for US Roads.” Issues in Science and Technology 34, no. 1 (Fall 2017).